How did Winston Churchill achieve so much? Today we see him as one of the great figures in history, but even in his sixties, in the “wilderness” of the 1930s, his final reputation was not apparent. Not many politicians have been through the kind of dormant season Churchill endured, only to come out the other side with even more success than they enjoyed the first time around. One key to his success was his rigidly observed daily schedule. His wilderness of 1929-39 divides his career in two—and most people would settle for either half. Having purchased Chartwell, his countryside home, in 1922, he found himself daily whiling away the hours as a bricklayer. His literary output was enormous, but when he wasn’t dictating to his teams of secretaries, he “at peace within my habitation,” laying bricks, digging ponds, sculpting terraces, planting gardens and painting in oils. It’s one thing to imagine the work he accomplished there, but the sight of it is truly remarkable. The view from the north-east side of Chartwell out over the gardens is spectacular. Yet he managed all this in addition to serving as a prominent politician and prolific author. It is interesting to contemplate how he mustered up the daily drive, to prepare for the destiny envisioned but not yet attained. The prologue to volume 2, Alone 1932-1940, begins in a more pedestrian vein. Manchester drops the reader off in 1932, on the front steps of “tree-locked and silent” Chartwell, in “the first olive moments of daylight,” just as the servants are beginning to stir. In his small bedroom, the master “sits bolt upright and yanks off his black satin sleep mask. He, not the sun, determines when he will greet the new day.” From the bedroom of “titian-haired” daughter Sarah comes the most popular hit of the season: “Night and day….You are the one….” As action mounts, it becomes obvious that only the man described in the second prologue could be ready for the scene described in the first. The day begins later than we might expect. Churchill is not a particularly early riser; he is a night owl, as we shall see shortly. Around 8 o’clock, he rips off his sleeping mask to the smell of breakfast and the sound of his “man,” David Inches, shuffling into his tiny bedroom. 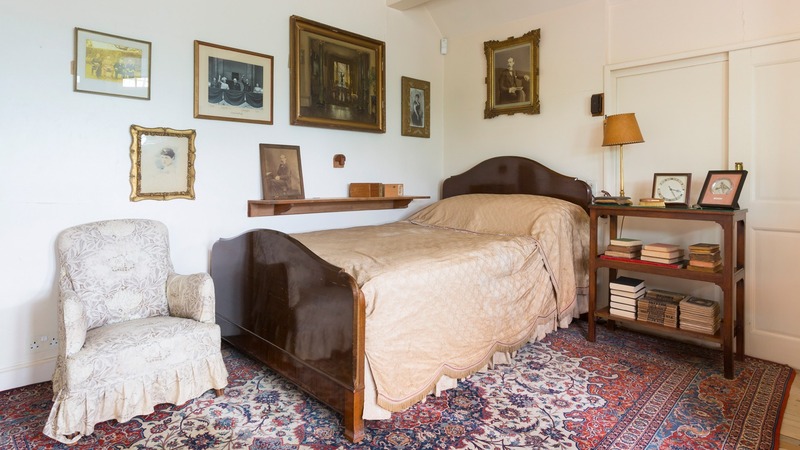 Every room in Chartwell, his “great keep,” bears signs of his innovations. On his bed Inches places a tray to his own design, with a cutout for his round belly that allows him to breakfast and work simultaneously. Churchill has a herculean appetite, beginning the mornings with a full English breakfast, often accompanied by meat from the previous night, and sometimes a glass of white wine. As he picks through his tray of food, he peruses the morning newspapers. Sometimes he rises, padding over to his beloved Clementine in her separate bedroom, to discuss a startling development. From his battle station he dictates letters, sips from a glass filled with water and a trickle of whisky, and reads until late morning. Then he bathes—Inches has filled the tub with water at exactly 98 degrees—dresses and begins his day. Lunch is followed by a walk round the gardens and ponds, cards with family and friends, promptly followed by a nap. His nap is exactly an hour long, done in pajamas and sleeping mask. It allows him, he says, to get thirty or more hours out of every twenty-four. Churchill’s daily schedule reveals an essential principle for success: he knows how to get things done. It’s tempting to say that he works hard when he is working and plays hard when he is playing. But that would be to miscategorize the nature of his work. He is one of the most productive men who ever lived, but he knows himself, and how to get the most bang for his pound sterling. To achieve productivity he operates by two principles. The first he learned from Napoleon, whose bust gazes across the desk in his study: strength of force in the most crucial places. The second is economy of effort. Economy of effort is one of Churchill’s brilliant characteristics. His daily work in bed saves energy for later, when he will often dictate from a stand-up desk. When traveling he is even more economical. “Never stand when you can sit down,” he will advise a visitor. “Never sit down when you can lie down; and never to miss an opportunity to visit a washroom, as there is no knowing when the next opportunity will occur.” When his nation calls, Churchill will be practiced at exerting strength in the most profitable areas. After his nap and, usually, a second bath of the day, Churchill prepares himself for his second work day, in reverse order. The morning began with work and ended with lunch; the evening begins with dinner and finishes with work. 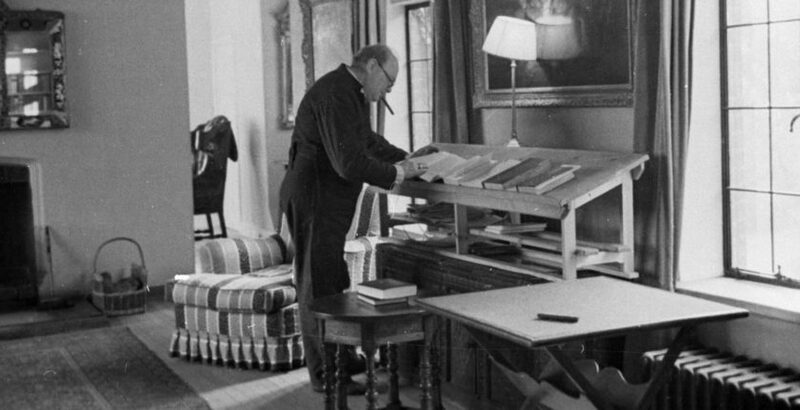 Despite entertaining his guests until midnight, with a movie after dinner, Churchill eventually retires to his study for the main event: writing. Boris Johnson has described Churchill as a 100-horsepower mental engine. Between the two world wars, he produced a five-volume memoir of World War I, an autobiography of his early years, a four-volume biography of his great ancestor, the first Duke of Marlborough, several books of essays and speeches, over four hundred articles. Men of genius are often thought to produce with little practice or refinement. Churchill was not this type; he was a tinkerer, a reviser. With some exaggeration, he says he might spend an hour in preparation for every minute of a speech. With relentless energy he perfects his craft. It is evidence of his genius. Known even in the 1930s as a mobilizer of the language, Churchill’s unconventional method of writing is as impressive as his voluminous output. When a great work like Marlborough is unfolding, the ground-floor library at Chartwell is home to a team of research assistants, at work providing every desired fact and resource. In his study, Churchill directs a daily battery of shorthand secretaries. Churchill’s energy is now at peak. He paces up and down the length of the room dictating, a hundred beams of light funneled through a prism into a single ray. He is notoriously impatient, even when his mumbling is the source of confusion. There is good reason. On a typical night, he will dictate several thousand words, turning over a word or phrase in an undertone before delivering the version he likes. It’s remarkable how well he can write by dictating; he is one of those rare people whose speech is easily converted into excellent prose. As the night wears on, Churchill continues his cadence until he is finally satisfied. Not to have achieved something positive and specific, he says, is like going to bed without having brushed one’s teeth. The night’s work finally accomplished, chomping the end of his cigar and nursing his glass of whiskey-flavored water, the great man makes his way back to his bedroom, just off his study, the smallest room in Chartwell. Churchill of course did not have the luxury of seeing the future, as we do. As he slipped his velvet sleeping mask on in those days before the war, he must have wondered whether he would ascend at last to the pinnacle, or be a footnote in the annals of history. For the time being, he must press on, toward an unclear but certain fate, exerting the greatest force with economy of effort, on his vital tasks, day after destined day. Mr. Feix is writing his dissertation for a Ph.D. in Philosophy from Southern Baptist Theological Seminary in Louisville, Kentucky. He holds a degree in mathematics and philosophy from Oklahoma State University and a M.Div. from Oklahoma Christian University.